Trauma victims are at higher risk of dying and complications if treated at a hospital serving predominantly black patients. The findings suggest that trauma victims receive lower quality care at hospitals with more black patients. Victims of trauma are at higher risk of either dying or suffering a major complication if they are treated at a hospital that serves a large population of black patients, finds a large new study in Health Services Research. This discrepancy persists despite efforts to reduce health care disparities and the fact that trauma outcomes overall have improved in the past decade. Study author Dana Mukamel, Ph.D., professor of medicine at the University of California in Irvine explained that discovering that Blacks are more likely to die or suffer complications after a trauma admission suggests that they received lower quality care. Trauma includes victims of car crashes, gun related injuries and falls. “We showed that the disparity in care reflects the fact that Blacks are typically treated in different hospitals, ones with lower quality care,” she said. She added that the findings revealed that the disparities in outcomes did not reflect patients of different races being treated differently within the same hospital. The research team, led by Laurent Glance M.D. 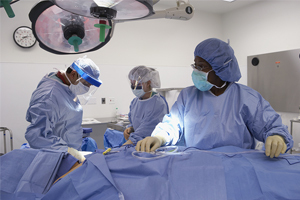 of the University of Rochester Medical Center studied data for 191,887 patients admitted to Pennsylvania trauma centers between 2000 and 2009. The researchers found that both black and white patients treated at hospitals with a high concentration of black trauma patients had a 45 percent higher risk of death and a 73 percent higher risk of death or a major complication when they were compared to patients of both races who were admitted to hospitals that treat low proportions of black patients. The authors noted that trauma is a leading cause of death among black Americans. Blacks in the U.S. have a life expectancy six years shorter than whites and trauma contributes almost as much to this discrepancy as heart disease, stroke and cancer combined. “This groundbreaking work shows us a path forward,” said Adil Haider, M.D., MPH, a Johns Hopkins trauma surgeon and another leading researcher in trauma disparities. He noted that having studied ten years of data, this study’s authors found that the hospitals that treat a high proportion of minority patients are the same ones treating a high proportion of uninsured patients. “So they are working in very difficult circumstances. They get much less money to function,” he said, adding that many uninsured people want insurance but just cannot afford it. This study has vital messages for policy makers, both researchers stated. “If we find a way to bolster those hospitals that provide care to a high proportion of both minority and uninsured patients, we will improve care not only for those groups but for everybody treated at those institutions,” said Dr. Haider. On the other hand, the authors wrote, incentive programs that concentrate rewards on high performing hospitals may have the unintended consequence of actually widening the racial gap in trauma care. The authors suggest that rewarding incremental improvement may be a better way to improve hospitals that heavily serve uninsured and minority populations, as opposed to basing incentive payments on measures of absolute performance.